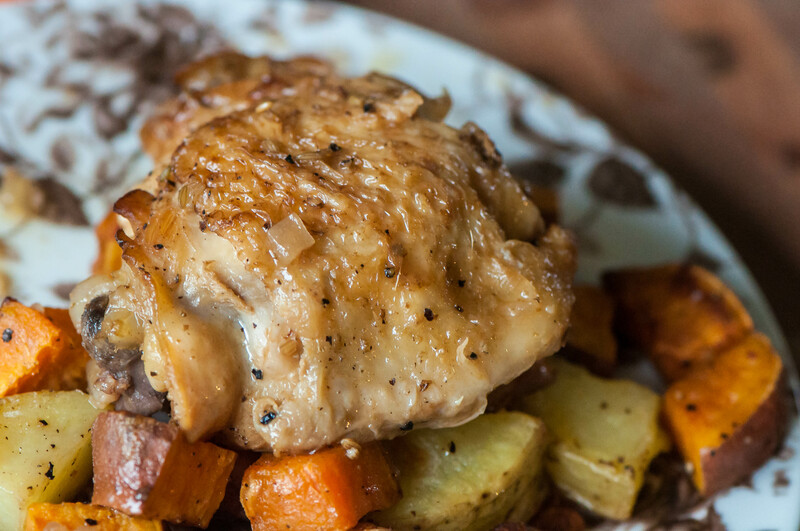 Hard Apple Cider Braised Chicken Thighs are a new fall favorite around here. Simmered in, you guessed it, hard apple cider, chicken stock, onion and fennel seeds, this chicken is bursting with all the warm, hearty flavors of fall. So I’m pretty basic when it comes to my love of all things fall. Scarves, sweaters, pumpkins adorning the front porch, apple picking, pumpkin and salted caramel flavored everything, I love it all and I’m not afraid to admit it. I also have to admit I love hard apple ciders. This is a new discovery this year thanks to our Ireland trip. I’ve never been a big drinker, and especially not beer, so I have always passed them up in the past. But we shared a many a pint of Bulmers while we were in Ireland, because when in Ireland do as the locals do. And hard apple ciders have been my drink of choice since. I haven’t found any Bulmers at home so we’ve taken to Angry Orchard or Redds. They’ll do I suppose. I’ve been wanting to try braising something recently and with fall fast approaching I knew it was the perfect opportunity to try it. I was watching a cooking show and the host braised beef short ribs in beer and that set off a lightbulb that I should take our new favorite hard apple cider and braise some chicken in it. I wanted to keep this braised chicken simple so you could really taste the hard apple cider but not too basic so I jazzed it up with some flavors that go amazingly with apples, onions and fennel. I don’t know about you, but I’m not one to keep fennel on hand so I used a heaping tablespoon of fennel seeds that I toasted in olive oil as the onions softened. Once the onions were softened and the fennel seeds aromatic, I removed them from the pan, bumped up the heat and got a nice sear on the chicken thighs then remove them from the sillet. Then comes the most delicious part of all. Add the onion mixture back into the pan and pour in that hard apple cider, scraping up all the browned chicken bits on the bottom of the pan. Some chicken stock goes in the mix too to bulk up the sauce and add an additional level of richness. Bring it to a simmer for a few minutes then add the chicken back to the skillet, cover and cook away on the stovetop until the chicken is cooked through and delicious. I took an additional step of putting the chicken under the broiler for a couple minutes to crisp the skin back up while I reduced the sauce a bit. This step is optional but I love the crisp skin and the thickened, almost syrup-y sauce. When you reduce a sauce, it really concentrates the flavors making it even more tasty. Plus, it coats the chicken rather than running off like a drippy mess. The braising process creating a moist, tender, fall off the bone chicken that is heavenly with the apple, onion, fennel combination. It’s delicious served with roasted veggies, mashed potatoes, polenta or just a simple side salad. What I’m really saying is, it’s good with anything. Heat a skillet (large enough to fit all the chicken) over medium heat. Add 1 tablespoon olive oil and heat. Add the onion and fennel seeds to the skillet and sauté until onion is translucent, 3 to 5 minutes. Remove onion mixture from the pan and bump heat up to medium-high. Add remaining 1 tablespoon olive oil. Season chicken with salt and pepper then add to the pan. Sear on first side until golden brown, 4 to 5 minutes. Salt and pepper second side then flip. Sear second side then remove to a plate. Add onions back to the skillet along with the hard apple cider and 1/2 cup chicken stock. Allow it to boil for 4 to 5 minutes then return the chicken to the skillet. You want the liquid to reach halfway up the chicken. If you need more liquid, add a bit more chicken stock. Reduce heat to low so the liquid is simmering but not boiling. Cover and cook for 45 minutes, or until chicken is cooked through. Optional step: Remove the chicken from the pan and place under the broiler until the skin browns and crisps up. This will only take a minute or two so keep a close eye on it. While you are broiling the chicken, bump heat on skillet to medium high heat and boil for a few minutes to reduce and thicken the sauce. Remove chicken from the broiler and spoon some of the sauce on top. I highly recommend this step.